Call me a dinosaur, someone so out of touch with today’s media world as to be but a distant spot in the rear-view mirror of today’s electrically-powered, driverless transportation module, but I really don’t get the fuss about online influencers. First off – why is this new? 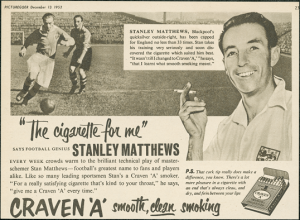 There have been celebrities in advertising since Stanley Matthews told us in 1952 how he smoked Craven ‘A’s before destroying the opposition. And no doubt long before then too. There’s been hundreds of celebrities in ads, from Morecambe and Wise for Texaco, through to George Clooney for Nespresso. And who could forget Pepsi and Kendall Jenner (Pepsi would no doubt like the answer to that question to be ‘everyone, please’)? Aren’t online influencers the modern-day equivalents of good old Stan? What are advertisers buying with influencers? Authenticity. Awareness. Newsworthiness. Plus influencers come with their own online audience, whereas celebs in ads build an audience from those provided by the channel. ‘Influencer marketing’ is in itself a triumph of marketing. If something is going to work in today’s marketing and agency worlds, it has to appear to be new and shiny. As with ‘native’ or as us old gits would have it: ‘advertorials’. By the way, hasn’t the fuss around native died down a bit recently? Or am I just filtering it out? In 2018 Kantar Media released a study called Dimension. It was the second in the series; the third will be launched this Spring. ‘Celebrity endorsements’ was the worst-scoring option named by 9%. Even blogs scored 15%. Except in China where celebrities scored 26%. And beat bloggers (18%). There are more detailed studies on how using celebrities can add a great deal, but as the KM work suggests this does seem to be a lot of fuss about not much. Yes of course having a celebrity promote your product, especially if he or she provides an audience of adoring followers can be a good thing. It can drive awareness and add a degree of credibility amongst those in the intersection between loving the celebrity and being in the market for the brand. But influencers need to be selected and then used in a way designed to use their strengths as an integrated part of an overall marketing campaign, not in a manner that has nothing to do with the brand’s strategic communication goals. My social media feeds regularly fill with posts ridiculing so-bad-they’re-laughable uses of the influencer channel. Which only goes to show, as with so much online advertising, that once we start caring more about un-verified numbers (fake followers, bots, fraud and the rest) than we do about ensuring that what we say informs, intrigues and entertains then we’re screwed. If those hiring the influencers could remember that fit, creativity and authenticity are far more important than meaningless numbers, then everyone would benefit. And I’m a media guy for goodness sake.